Why write a retirement letter? 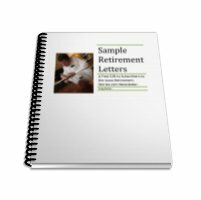 Why write a retirement letter? To quote from the Life of Pi, by Yann Martel ... "it's important in life to conclude things properly. Only then can you let go ..."
I feel that it is essential to give a sense of closure and transition to important work-based relationships. Now that I am retired I drop by the office once or twice a year. I'm warmly welcomed and my former colleagues seem genuinely happy to see me. But I no longer fit in, nor do I expect to. I have new stories now, and so have they. I'm delighted to be invited to the annual Christmas party, and to the occasional social club outing. And should the need arise; I believe we would support each other. It's a different story with the wider business community connected to my former employer. All contact with them ceased abruptly. The work was the glue holding those relationships together. Some of these connections were close and personal, e.g. I got invited to Christenings and Weddings, but they didn't continue in retirement. None of this surprised me, I had prepared well for retirement, and I have the happiest memories of the work, and leisure, I shared with so many wonderful people. I got a wonderful send off on my retirement, with several retirement dinners and retirement gifts. This was something I felt very grateful for. I know of other people, who may have worked as skillfully and diligently as I had, only to have a disappointing end to their career. Mergers and acquisitions, rightsizing and downsizing, competition from younger people on the way up, ill health, concerns about retirement financial planning - these can all affect your contribution and competence in the years prior to retirement. I was fortunate to be in a company that was expanding and diversifying so that I was challenged and active right to the finish. These letters were important, because I was not going to be able to say a personal farewell and thanks to everybody in my circle, especially external relationships. And even where I could, I think it was appropriate to follow it with a letter. Also, even in this era of instant communication via cell phones and email, people like to receive letters. I know in at least one case the recipient was delighted to show the letter to his colleagues! Nowadays, I find that I often make contact with Retirement Coaching clients for the first time when they want help with their Retirement Letters and Retirement Speeches. .... AND .... if you want to read more Great Retirement Letters, see our great free gift below!